In this Apollo 17 onboard photo, Mission Commander Eugene A. Cernan adjusts the U.S. flag deployed upon the Moon during the December 1972 lunar landing mission, which marked the last of NASA's Apollo Moon landings. In the late 1960s and early 1970s, NASA launched the Apollo missions to the moon that ultimately landed 12 astronauts on the lunar surface in a series of historic missions. Or did they? Actually, yes, NASA did. But that hasn't stopped conspiracy theorists from maintaining that humans never set foot on the lunar surface, and that the entire effort was massively staged event for the world to see. Take a look at some of the wildest Apollo moon hoax claims, and the real science that debunks them. The Claim: The American flag appears to wave in the lunar wind. The Science: If you look closely, you will notice the flag's edges are pulled taut. This effect, which was done purposely as to not allow the flag to just hang flat, it was created by inserting a stiff wire into the fabric. 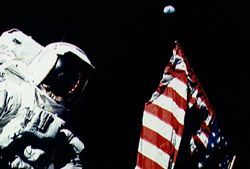 The "flutter" was created as the astronauts worked to erect the flag. As the wire was adjusted, "Old Glory" appeared to wave. The Claim: If the astronauts had left the safety of the Van Allen Belt the radiation would have killed them. The Science: The Van Allen Belts are created by Earth's magnetic field, and protect the planet from dangerous solar radiation. The belts collects this radiation, and traps it in a layer surrounding the Earth. But unless you deliberately caused your spaceship to hover within this layer, for many hours or days, the radiation exposure is well below dangerous levels. The Apollo astronauts passed through the belts in less than four hours total for the trip. "It's not much more serious than getting a chest x-ray," said Plait. The Claim: Multiple-angle shadows in the moon photos prove there was more than one source of light, like a large studio lamp. The Science: The astronauts were taking their photos on a hilly, brightly-lit landscape while the sun was close to the horizon. Imagine taking a photograph of someone on a rolling, uneven field of snow during a full, low-hanging moon. The contours of the ground would produce shadows of many different lengths. The Claim: In the sun's rays, the Moon's temperature is toasty 280 degrees F. The film (among other things) would have melted. The Science: No one was leaving bare film out on the hot lunar surface. All material was contained in protective canisters. In addition, at the time the Apollo missions landed, they were either at lunar dawn or dusk. As a result, the temperature was more easily manageable. The Claim: To leave a footprint requires moisture in the soil, doesn't it? The Science: Not always. If you take some dry fine-grained dust such as talcum powder and dump it out, it's easy to make tracks in it that hold their shape. The particles hold their positions due to the friction between them. The Claim: Space is filled with super-fast micrometeors that would punch through the ship and kill the astronauts. The Science: Space is really amazingly big. While there are indeed an uncountable number of tiny pieces of debris travelling through the solar system at speeds in the neighborhood of 120,000 MPH, the volume of space keeps the density low. The chance of any given cubic yard of space having a micrometeor passing through it is incredibly close to zero. Additionally, the astronauts suits included a layer of Kevlar to protect them from any tiny fragment they might encounter. The Claim: When the Lunar Excursion Module (LEM) landed, its powerful engine didn't burrow a deep crater in the "dusty surface." The Science: Beneath the layer of dust, the moon is made of fairly densely-packed rock. What dust and loose dirt there was, though, was "kicked up" as referenced by the astronauts and captured in their landing films. The Claim: There's no way that big moon buggy they were driving could have fit into that little landing module! The Science: The rover was very cleverly constructed to be made out of very light materials, and designed to fold up compactly, a real-life "Transformer." 9) It's Full of Stars! The Claim: Space is littered with little points of lights (stars). Why then are they missing from the photographs? The Science: If you've ever taken a photograph outside at night, you'll notice that faint distant objects don't show up. That's not because the air blocks them — it's because the brightness of the nearby objects washes out the film. In fact if you were standing on the day side of the moon, you'd have to somehow block the landscape out in order for your eyes to adapt enough to pick out the stars.